For many visitors to Cambodia, the town of Siem Reap is simply a base from which to explore the fabled ruins of Angkor Wat. But once you've spent a day or three clambering over the 12th century temple complex, it's worth getting to know more of Siem Reap. Cambodia's cultural capital has thrived on tourism ever since French explorers stumbled across Angkor in the 19th century. Here, three savvy Cambodians tell you how to plan an ideal Siem Reap day. I'd begin with a guided tour of the Artisans D'Angkor workshops at the National Silk Centre, tel: (855-63) 963 330. Cambodia has a strong tradition of weaving, and here you can learn everything there is to know about Khmer silk, from worm to loom. After lunch, I'd hit Senteurs d'Angkor, tel: (855-12) 954 815, to pick up some Khmer coffee  it's grown in Rattanakiri province  before strolling along an alleyway known locally as "the Passage." That's where you'll find John McDermott's photo gallery, tel: (855-92) 668 181. 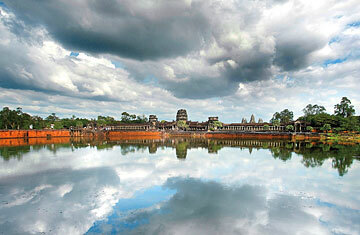 I love his images of Angkor Wat. Then I'd duck into the ArtDeli, artdeli.org  it's a gallery, café and workshop space that's a fun place to hang out in the afternoon. Come happy hour, I can usually be found at in the Elephant Bar at Raffles Grand Hotel d'Angkor, tel: (855-92) 963 888, and then I'd probably work up an appetite by wandering through the craft stalls at the night market. If I'm not cooking dinner at home, I'll get a candlelit table with some friends at Abacus Garden, tel: (855-12) 644 286. It's a top French restaurant and does great steaks, goat-cheese salad and tuna tartare. I like to start my day early, jogging under the trees along the river up past the FCC Angkor hotel, tel: (855-63) 760 280, or I'll take a 10-km loop through Angkor Wat. If it's too hot or I'm feeling lazy, I'll pack a picnic breakfast and hire a bicycle. Or if I really plan ahead, I'll make the one-hour drive to Kulen mountain around 8 a.m. to do some hiking and visit the waterfall, temple and big Buddha up there. You can buy food on the mountain, but I usually grab one of the picnic baskets from the Hotel de la Paix, tel: (855-63) 966 000. I also sometimes visit the bakery at the Sofitel Angkor Phokeethra, tel: (855-63) 964 600. They do the best baguettes in town, and like many Khmers, I enjoy my bread and pâté. Sometimes I'll have lunch with friends at Tonle Chaktomuk, tel: (855-63) 965 052, the buffet restaurant in front of the Angkor National Museum. I love their Asian desserts, particularly the hot tofu with sweet ginger sauce. Generally life here is very bohème, and the extent of my day's activities might be hanging at my friend Pisith Li's amazing silver-jewelry boutique, Garden of Desire, tel: (855-12) 319 116, or drinking gin and tonics on what's known as Pub Street. An espresso or latte and a flaky pastry at Raffles' Café d'Angkor is a great way to wake up, followed perhaps by a swim at the Victoria Angkor Resort & Spa, tel: (855-63) 760 428  they have an immense saltwater pool, perfect for laps. There's also a great pool at Hotel de la Paix, surrounded by lots of foliage for a sense of seclusion. For lunch, there are so many good local restaurants around. Make sure you try amok  freshwater-fish fillets marinated in coconut milk and cooked in banana-leaf cups. It's a delicious Cambodian specialty. Siem Reap is a great place to shop, so in the afternoon I'd visit the FCC arcade for embroidered silk couture at the Jasmine Boutique, or maybe I'd explore Psar Chaa  the Old Market. I might visit Eric Raisina at his home and workshop a few kilometers out of town, tel: (855-63) 963 207. He's a Madagascar-born, Paris-trained designer and produces handcrafted textiles that have been used by brands like Christian Lacroix and Yves Saint Laurent. Afterward, I might cool off Khmer-style, with a chilled coconut juice drunk straight from the husk. An unmissable experience is the balloon ride over Angkor Wat, tel: (855-12) 520 810. You clamber into a basket and rise up on a 200-m tethered-balloon flight to enjoy amazing aerial views of the temples, Phnom Bakheng, West Baray, Srah Srang and other ruins amid the surrounding jungle and rice paddies. If you want to really splurge, you can take a sightseeing flight with Helicopters Cambodia, tel: (855-63) 963 316. Afterward, I suggest an aromatherapy massage at Body Tune spa, tel: (855-63) 764 141, and then some dinner. Meric, Hotel de la Paix's signature restaurant, is my favorite spot for a lavish meal. Try their sweet-and-sour pomelo and prawn salad, then the lamb-loin-and-garlic confit, followed by fresh strawberries with pistachio ice cream. Move over to the hotel's Arts Lounge and have a digestif while feasting your eyes on the work of young Khmer artists. See 25 authentic Asian experiences.